Year of St. Paul - Our Lord, Come! The OC Development Office continues to seek current mailing addresses of all alumni of OC, AIC, and Holy Ghost schools, especially the classes of 2000, 1990, 1980, 1970, and 1960. These classes will be recognized at Homecoming festivities in October. Please forward this information as soon as possible (with year of graduation) to Kathy Hebert, Development Director, at kehebert @ yahoo.com or hebertk @ ocsvikings.com. Look for “THE SAGA” newsletter coming in July! 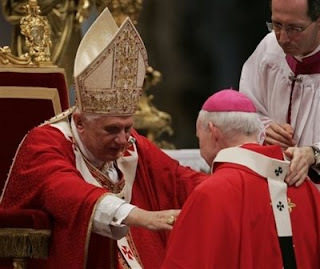 Archbishop Aymond of the Archdiocese of New Orleans receives his pallium from Pope Benedict XVI. Today is the Feast of Saints Peter and Paul. In Rome this morning, all archbishops that have been appointed over the past year received their palliums from the Holy Father as is done each year on this feast day. The pallium is a special stole made of lamb's wool that each bishop receives signifying the communion of all archbishops. Above is a photo from the AP showing newly appointed Archbishop Aymond of the Archdiocese of New Orleans receiving his. The Archbishop's pallium has black crosses on it. You can see the Holy Father's has red crosses. Today is the only day you'll see both archbishops and the Pope wearing them at the same time. At a Papal Mass, it's reserved for only the Holy Father to wear. This also marks the end of the Year of St. Paul allowing us to focus more fully on the Year for Priests that has begun. In the closing Vespers prayers last night, the Holy Father announced a few new discoveries in Rome. The oldest known icon of St. Paul, dating back to the 4th century, has been discovered in the tombs of St. Thecla. It has his characteristic furrowed forehead in the icon. See the following two photos. (more after the photos). The second major announcement deals with the studying of the sarcophagus found under the Basilica of St. Paul Outside the Walls. Carbon dating finds the bones date to the 1st or 2nd century. With the bones were found a very rich purple fabric and grains of incense. Tradition tells us that St. Paul was buried here and study seems to point to the validity of that claim. The Holy Father wanted to make St. Paul better known to us during this year. In the end, he's been known historically as well as spiritually. The current week's homily is available on a link on the front page of the website next to the link for the current week's bulletin. On the page with the prior bulletins, the corresponding homily will be sitting side by side with its bulletin. We started on the anniversary of the start of the Catholic Church, Pentecost Sunday. This week, The Thirteenth Sunday in Ordinary Time, is our fifth homily to be posted. This week, the homily is given by Monsignor Paul Metrejean. So, take a listen and let us know what you think. Click here to download the Thirteenth Sunday in Ordinary Time homily. Nonetheless, like the first Christian community we can say: Come Jesus! Of course, we do not want the end of the world to come now. On the other hand, we do want the world of injustice to end, we do want the world to change, the civilization of love to begin, a world of justice and peace to come, a world without violence and hunger. ... But without the presence of Christ a truly just and renewed world will never come". Today we recall the apostolic journey of Pope Benedict XVI to the United States and his call to us to cast the light of Christ upon the world. We can show our solidarity with the Holy Father and our suffering brothers and sisters abroad through our support of this week’s Collection. These funds allow him to provide emergency assistance to victims of war, disaster, oppression, and disease. Please be generous in today’s Peter’s Pence Collection. The Peter’s Pence Collection derives its name from an ancient custom. In ninth-century England, King Alfred the Great collected money—“pence” or pennies—from landowners as financial support for the Pope. Today, the Peter’s Pence Collection supports the Pope’s charitable work by giving the Holy Father the means to provide essential assistance. 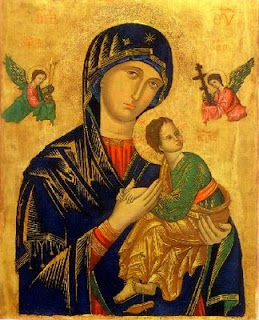 Today is the Feast of Our Lady of Perpetual Help. The icon has been venerated for more than 500 years. It features the Madonna looking solemn and facing the viewer. To the left is the Archangel St. Michael holding the lance and sponge used during Christ's Passion. On the right is the Archangel St. Gabriel carrying nails and a crucifix with 3 bars. The infant Jesus is startled with one sandal dangling off of his foot as he clings to his mother. Whenever I call on you. With merely uttering your name. Ever to hail you, Mother of Perpetual Help. God forms us in the divine image. Our abundance should supply the needs of the poor. Jesus raises a little girl from the dead. The images of healing presented in today’s gospel remind us of the power of God’s love to restore us to life when sickness and death surround us. Let our hearts be filled with praise as we listen to these remarkable stories of transformation. Let us pray that we, too, will be transformed by these saving words. How does sharing with others bring happiness to you? What are some of the miraculous moments in your own life? Do you ever pray for miracles? What is your personal response to St. Paul’s instruction to the Corinthians today? How will this change your personal habits with money and possessions? A day of prayer honoring Our Lady Queen of Peace will be held in St. Landry Catholic Church on 25 June, TODAY, beginning at 10:00 am. For more information call Renella Lavergne @ 942-6325 or Lois @ 942-6552. 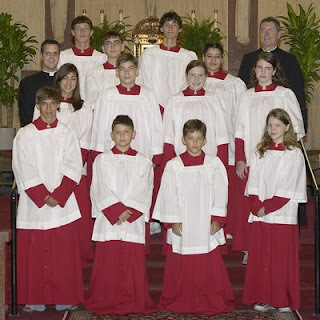 The bulletin for the weekend of June 28, 2009 has been posted. Click here to see it. The calendar on the website has been updated with all events for the coming week along with prayer intention information and information on the second collection for all of the masses. Take some time to look at our new calendar here. 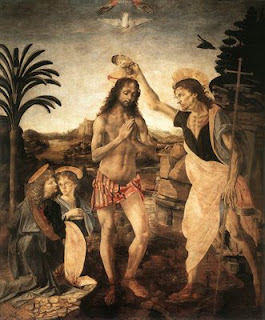 Today is the Feast of St. John the Baptist, the Forerunner of the Savior. We celebrate his nativity, his birth, 6 months before the birth of Jesus. Each morning, as part of the morning prayer in the Liturgy of the Hours, we pray the Canticle of Zechariah from the Gospel of Luke. It is the song sung by John's father upon naming him that contains a prophesy of what is to come for him. The “Father J. Wilson Matt” Scholarship was presented, during commencement, to Paige Ledoux, selected for her strong sense of Catholic faith, school spirit and willingness to serve. If you have not yet heard, Opelousas Catholic School is in the process of a uniform change for the students. For convenience purposes, these new uniforms will be available for sale on Tuesday, June 23rd, from 3 pm to 7 pm in Our Lady Queen of Angels Church Hall. Jesus Christ was sent by the Father, through the power of the Holy Spirit, for the salvation of the entire human family, and we priests are enabled through the grace of the sacrament to share in this mission of his. As the Apostle Paul writes, “God…has given us the ministry of reconciliation……. This makes us ambassadors for Christ, God as it were appealing through us. We implore you, in Christ’s name: be reconciled to God” (2 Cor 5:18-29). This is how St. Paul describes our mission as priests. 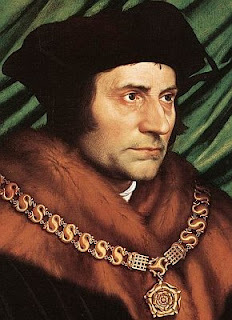 Today, we remember the life of St. Thomas More, the patron saint of attorneys and politicians ... as well as large families. He was martyred, beheaded, by King Henry VIII of England for refusing to pledge allegiance to Henry as head of the Church. Though not totally factual, a beautiful movie based on his life is "A Man for All Seasons". For information on the movie, click here. To purchase the movie, click here. For basic information about his life, click here. The current week's homily is available on a link on the front page of the website next to the link for the current week's bulletin. On the page with the prior bulletins, the corresponding homily will be sitting side by side with its bulletin. We started on the anniversary of the start of the Catholic Church, Pentecost Sunday. This week, The Twelfth Sunday in Ordinary Time, is our fourth homily to be posted. So, take a listen and let us know what you think. Click here to download the Twelfth Sunday in Ordinary Time homily. The following video is one produced by the Diocese of New York a couple of years ago by Grassroots Films. The young people who run that fine Catholic film company visited our students at Opelousas Catholic School this year. It's a beautiful video with Pope John Paul II's words "Be not afraid". The Lord speaks to Job out of the storm. Jesus calms the stormy seas. We profess that God’s word is living and active. It can change our hearts. Even when the seas of life churn and become stormy, God’s word is a beacon leading us to calmer waters. Let us be attentive to God’s saving word. How would you have felt if you were with Jesus and the disciples during the storm? Jesus is capable of great things, even calming storms. What is one thing that you wish he would calm in your own life? When and where have you been awed by God’s action? Today is the Feast of the Immaculate Heart of Mary. Over history, Saturday has been associated with Marian devotions including setting out on Marian pilgrimages. This Feast falls on the Saturday following the Feast of the Sacred Heart of Jesus each year. In the apparitions at Fatima, Mary made a promise to Lucia, "My Immaculate Heart will be your refuge and the way that will lead you to God". Click here to read more on the apparitions at Fatima as related to the Immaculate Heart. Below is a sermon by Saint Laurence Justinian, bishop (1381-1455) on the verse from Luke's gospel, 2:51, "And he went down with them and came to Nazareth, and was obedient to them; and his mother kept all these things in her heart." The sermon is part of the readings from this morning's Office of the Readings in the Liturgy of the Hours. "Mary stored up all these things in her heart"
While Mary contemplated all she had come to know through reading, listening and observing, she grew in faith, increased in merits, and was more illuminated by wisdom and more consumed by the fire of charity. The heavenly mysteries were opened to her, and she was filled with joy; she became fruitful by the Spirit, was being directed toward God, and watched over protectively while on earth. So remarkable are the divine graces that they elevate one from the lowest depths to the highest summit, and transform one to a greater holiness. How entirely blessed was the mind of the Virgin which, through the indwelling and guidance of the Spirit, was always and in every way open to the power of the Word of God. She was not led by her own senses, nor by her own will; thus she accomplished outwardly through her body what wisdom from within gave to her faith. It was fitting for divine Wisdom, which created itself a home in the Church, to use the intervention of the most Blessed Mary in guarding the law, purifying the mind, giving an example of humility and providing a spiritual sacrifice. Imitate her, O faithful soul. Enter into the deep recesses of your heart so that you may be purified spiritually and cleansed from your sins. God places more value on good will in all we do than on the works themselves. Therefore, whether we give ourselves to God in the work of contemplation or whether we serve the needs of our neighbor by good works, we accomplish these things because the love of Christ urges us on. The acceptable offering of the spiritual purification is accomplished not in a man-made temple but in the recesses of the heart where the Lord Jesus freely enters. The New York Times has an article on a new exhibit at the New York Metropolitan Museum of Art called "Pen and Parchment: Drawing in the Middle Ages". 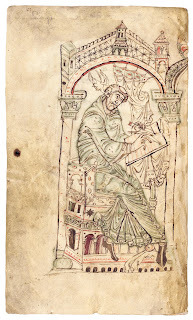 Much of it centers around the beautiful drawings found in the illumination of manuscripts. Click here for photos of some of the items in the exhibit. Click here for the article describing the exhibit. And, best of all, click here for images of items at the Met. Today begins the Year for the Priest, it's the 150th anniversary of the death of St. John Vianney, and it is also the Feast of the Sacred Heart of Jesus. On EWTN today at 10:30 AM CST, they will be covering live events from Rome. The relics of St. John Vianney will be brought to St. Peter's Basilica in Rome followed by Vespers with the Holy Father. Click here to read the letter from the Holy Father proclaiming this as the Year for Priests. 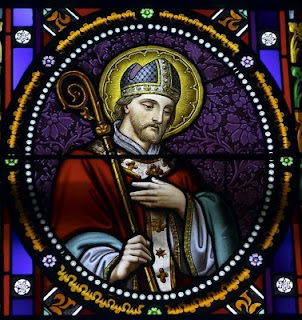 To those who, on the other hand, came to him already desirous of and suited to a deeper spiritual life, he flung open the abyss of God’s love, explaining the untold beauty of living in union with him and dwelling in his presence: “Everything in God’s sight, everything with God, everything to please God… How beautiful it is!”. And he taught them to pray: “My God, grant me the grace to love you as much as I possibly can”. In his time the Curé of Ars was able to transform the hearts and the lives of so many people because he enabled them to experience the Lord’s merciful love. Our own time urgently needs a similar proclamation and witness to the truth of Love: Deus caritas est, God is love (1 Jn: 4:8). 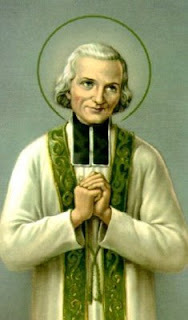 Thanks to the word and the sacraments of Jesus, John Mary Vianney built up his flock, although he often trembled from a conviction of his personal inadequacy, and desired more than once to withdraw from the responsibilities of the parish ministry out of a sense of his unworthiness. Nonetheless, with exemplary obedience he never abandoned his post, consumed as he was by apostolic zeal for the salvation of souls. He sought to remain completely faithful to his own vocation and mission through the practice of an austere asceticism: “The great misfortune for us parish priests – he lamented – is that our souls grow tepid”; meaning by this that a pastor can grow dangerously inured to the state of sin or of indifference in which so many of his flock are living. He himself kept a tight rein on his body, with vigils and fasts, lest it rebel against his priestly soul. Nor did he avoid self-mortification for the good of the souls in his care and as a help to expiating the many sins he heard in confession. To a priestly confrere he explained: “I will tell you my recipe: I give sinners a small penance and the rest I do in their place”. Aside from the actual penances which the Curé of Ars practiced, the core of his teaching remains valid for each of us: souls have been won at the price of Jesus’ own blood, and a priest cannot devote himself to their salvation if he refuses to share personally in the “precious cost” of redemption. 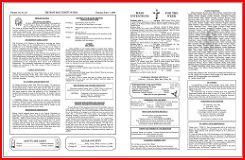 The bulletin for the weekend of June 21, 2009 has been posted. Click here to see it. Above is the icon being used to promote the Year for Priests, called "Christ the Great High Priest". Click the icon to see it full sized. 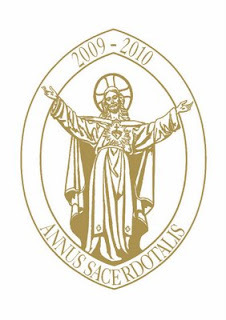 Iconographer Marek Czarnecki of Seraphic Restorations in Meriden, Connecticut, has graciously given the USCCB the rights to use the icon of Christ the Great High Priest during the Year for Priests. Any parish or diocese that would like to use the image in conjunction with this special year is also permitted to do so. This icon (egg tempera and gold leaf on wood panel, 28” x 22”) is “based on a fifteenth century Greek prototype; here Christ is shown in Latin Rite vestments with a gold pelican over His heart, the ancient symbol of self-sacrifice. The borders contain a windig grapevine and altar prepared for the celebration of the liturgy of the Mass; in the borders are smaller icons of Melchizedek and St. Jean-Baptiste Vianney.” Incidentally, it is St. John Vianney whom Pope Benedict XVI, with the announcement of this special year, has declared the Universal Patron of Priests. Czarnecki explains: “I wrote the icon about seven years ago [for seminarians and priests] to be able to see Christ in themselves, and themselves in Christ. We often hear that the icon is called a window; in this case, it’s also meant to be a mirror.” The Good Shepherd reminds the priest that he is to “lay down his life for his sheep.” Click here for his website. Click here to order a poster for $15 before shipping charges. Any licensed mental health professional who is interested in being part of the counseling referral list for the Office of Family Life, please call 261-5653 to make an appointment with our director, Fr. Jude Halphen, to discuss the professional services you have to offer. According to a decree made public and signed by Cardinal James Francis Stafford and Bishop Gianfranco Girotti, O.F.M. Conv., respectively penitentiary major and regent of the Apostolic Penitentiary, Benedict XVI will grant priests and faithful Plenary Indulgence for the occasion of the Year for Priests, which is due to run from 19 June 2009 to 19 June 2010 and has been called in honor of St. Jean Marie Vianney. The period will begin with the Solemnity of the Sacred Heart of Jesus, "a day of priestly sanctification", says the text, when the Pope will celebrate Vespers before the relics of the saint, brought to Rome for the occasion by the bishop of the French diocese of Belley-Ars. The Year will end in St. Peter's Square, in the presence of priests from all over the world "who will renew their faithfulness to Christ and their bonds of fraternity". 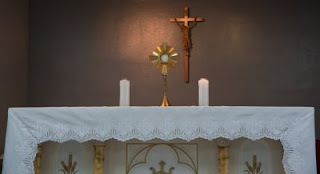 (A) All truly penitent priests who, on any day, devotedly pray Lauds or Vespers before the Blessed Sacrament exposed to public adoration or in the tabernacle, and ... offer themselves with a ready and generous heart for the celebration of the Sacraments, especially the Sacrament of Penance, will be granted Plenary Indulgence, which they can also apply to their deceased confreres, if in accordance with current norms they take Sacramental Confession and the Eucharist and pray in accordance with the intentions of the Supreme Pontiff. Priests are furthermore granted Partial Indulgence, also applicable to deceased confreres, every time they devotedly recite the prayers duly approved to lead a saintly life and to carry out the duties entrusted to them. (B) All truly penitent Christian faithful who, in church or oratory, devotedly attend Holy Mass and offer prayers to Jesus Christ, supreme and eternal Priest, for the priests of the Church, or perform any good work to sanctify and mould them to His Heart, are granted Plenary Indulgence, on the condition that they have expiated their sins through Sacramental Confession and prayed in accordance with the intentions of the Supreme Pontiff. This may be done on the opening and closing days of the Year of Priests, on the 150th anniversary of the death of St. Jean Marie Vianney, on the first Thursday of the month, or on any other day established by the ordinaries of particular places for the good of the faithful. The elderly, the sick and all those who for any legitimate reason are unable to leave their homes, may still obtain Plenary Indulgence if, with the soul completely removed from attachment to any form of sin and with the intention of observing, as soon as they can, the usual three conditions, "on the days concerned, they pray for the sanctification of priests and offer their sickness and suffering to God through Mary, Queen of the Apostles". 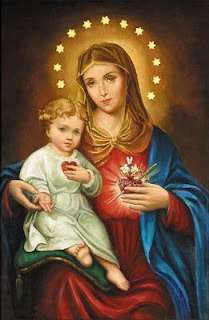 Partial Indulgence is offered to all faithful each time they pray five Our Father, Ave Maria and Gloria Patri, or any other duly approved prayer "in honour of the Sacred Heart of Jesus, to ask that priests maintain purity and sanctity of life". A day of prayer honoring Our Lady Queen of Peace will be held in St. Landry Catholic Church on 25 June beginning at 10:00 am. For more information call Renella Lavergne @ 942-6325 or Lois @ 942-6552. Perhaps everyone is tired of reading about the controversy surrounding the graduation ceremony at the University of Notre Dame. Statements of support and cries of criticism have been numerous and strong. The issue of abortion continues to provoke strong reactions from many quarters, even 36 years after Roe vs. Wade decision. Even though media attention has passed, I believe it is important to reflect on the meaning of the whole event. Similar events are bound to occur in the future. It seems that the immediate question was not the morality of abortion or even its legality. Of course, these issues are at the basis of the whole debate. Without them, there would have been no debate. Without them, there would have been no debate. But the immediate question was the propriety of a Catholic institution conferring an honor on a politician or public personality who supports abortion rights. The decision of Notre Dame to invite President Barack Obama to deliver the graduation address and to receive an honorary degree was the cause of the controversy. It was a debate about a prudential judgment made by the University. I believe the University made the wrong judgement. I believe it missed an opportunity to provide witness to the sanctity of human life as understood by the Catholic Church and as proclaimed by the University itself. The world needs such witness today. I support the decision of Bishop John D’Arcy, Bishop of South Bend, to give witness to the sanctity of human life by not attending. I applaud Dr. Mary Ann Glendon who was chosen to receive the prestigious Laetare Medal, but declined the honor in order to give witness to the sanctity of human life. President Obama addressed the controversy directly and said that people who differ in their beliefs should still engage one another in mutual respect. He said that in the abortion debate, the two sides should seek common ground. I agree with his remarks. Mutual respect is important. With regard to common ground, I should note that it does not mean compromise. Catholics do share common ground with the President on many issues, especially in the area of social justice. On the issue of abortion, Mr. Obama said that both sides should “work together to reduce the number of women seeking abortions…” Both sides will probably agree on that goal, but there will be differences on the means of achieving it. I hope the President continues to reflect on this goal of reducing the number of women seeking abortions. Why does he wish to pursue this goal? Is it possible that all human beings have a voice of conscience which judges abortion to be an unspeakable crime? Abortion has been legal in the United States for 36 years, but people are still uneasy about it. Reducing the number of abortions is a worthy goal, but it is inadequate. When Mr. Obama looked at the torture of prisoners, he did not say that the number of tortured prisoners should be reduced. He moved to eliminate it all together. One could hope for the same attitude toward abortion. Another thought concerns the issue of science. Mr. Obama has said that science should be returned to its rightful place in public policy decisions. He was talking about climate change accusing the previous administration of ignoring the conclusions of scientists .One might hope that scientists would be consulted on the nature of human embryos. Scientists will say that it is a being, which simply means something that is .They will say that it is human, citing the evidence from genes and chromosomes. They will say that it is living, since given the proper conditions, it will grow and develop. Could we not say that science compels us to call the embryo a living human being? Could we not then go beyond science and conclude that innocent human beings deserve the protection of law in the United States? Despite all that has taken place, I believe that we should remember that the University of Notre Dame is a Catholic institution and that it provides a great service to the Church and to society. It continues to deserve our respect and support, even it we differ on the prudential judgment made with regard to the graduation. In business around Acadiana, one sees small sins which read, “Ici on parle francais” (Here we speak French). Perhaps in all of our churches, homes, schools, and institutions, we need similar signs which read, “Ici on ne tue pas les enfants” (Here we do not kill our children). Taken from the Bishop’s Column in the June 2009 Issue of Acadiana Catholic. 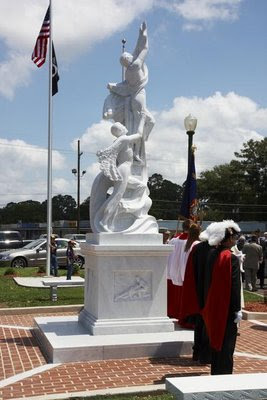 Each Monday at 6 PM during hurricane season, the parishioners of St. Landry Catholic Church will be praying the rosary at the Lt. Father Verbis Lafleur Monument in front of St. Landry Catholic Church in Opelousas, Louisiana. Please join us each Monday. We encourage you to bring your rosary and a lawn chair for comfort. The current week's homily is available on a link on the front page of the website next to the link for the current week's bulletin. On the page with the prior bulletins, the corresponding homily will be sitting side by side with its bulletin. We started on the anniversary of the start of the Catholic Church, Pentecost Sunday. This week, The Feast of Corpus Christi, is our third homily to be posted. So, take a listen and let us know what you think. Click here to download The Feast of Corpus Christi Sunday homily. There are a few events coming together. We celebrate the 150th anniversary of the death of the saintly Cure’ of Ars, St. John Mary Vianney. We celebrate on June 19, 2009, the feast of the Sacred Heart of Jesus and the World Day of Prayer for the Sanctification of Priests. We celebrate a special Year for Priests. While we all have a participation in the common priesthood of the faithful by reception of the Sacraments of Christian Initiation [Baptism, Confirmation, Eucharist], the ministerial priesthood is the focus of the Year for Priests. We strive to deepen our knowledge of Christ’s intention when He instituted the Ordained Priesthood at the Last Supper. This deeper knowledge is meant for the priest to rediscover and grow with more intensity in his life. The whole church is called to understand and appreciate the need for ministerial priesthood. 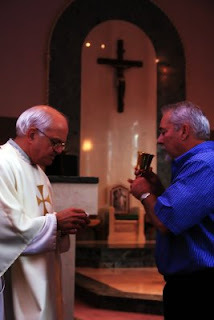 Without the Ministerial Priest, there is no Eucharist, no church. The Holy Father points out four dimensions. These are ecclesial, communional, hierarchical, and doctrinal. However, I can best summarize by stating what I ask the first Communion students. “ When I pray the words “this is my body”, “this is my blood” at Mass, why is it Jesus’ Body and Blood?” Why is it not Msgr. Romero’s body and blood?” The answer is that I stand in the place of Jesus Christ at the altar. It is Jesus Christ’s Body and Blood, because there is one priest, Jesus Christ himself. I take his place because I am ordained and set aside in the church to be in the place of Christ as Head of the Church. This is a new life, a new way of life that is special to the ministerial priest. 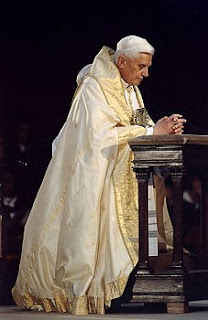 This is an aspect the priests of the church are called by, Pope Benedict, to make more intensely their own. It is the life of Jesus Christ in his love for the church. It is the church’s, that is those in the common priesthood of the faithful, to appreciate in the ministerial priest at the altar, Christ’s love for the church and the church’s love for Christ. 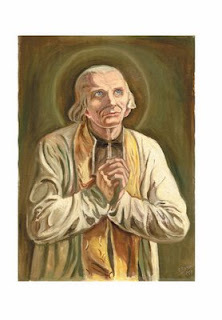 In addition, Pope Benedict XVI will name St. John Vianney patron of all priests, not just patron of diocesan priests. St. John Vianney lived the theme for the Year for Priests. That theme is “Faithfulness of Christ, faithfulness of priests”. In his own person, the church sees in St. John Vianney the faithfulness of Christ. In his own person, the church sees in St. John Vianney the faithfulness of priests to Christ and to Church. St. John Vianney’s ministry is filled with a dedication and love for Christ and for everyone to love Christ themselves. 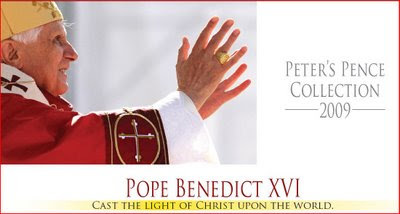 Pope Benedict XVI then hopes the whole church will be more dedicated to Christ in every parishioner’s life as the priests of the church strive to intensify their life with Jesus Christ and as parishioners see the love of the Sacred Heart of Jesus in the life of every ordained priest. At St. Landry Church, on the side where Mary’s altar is, we have a statue of the Sacred Heart of Jesus to the left of Mary’s altar as we view the altar from the pews. 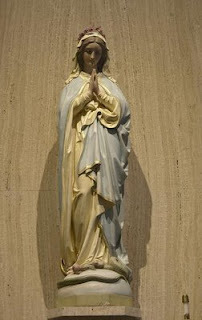 We also have a statue of St. John Vianney on the wall to the right of Mary’s altar as we view the altar from the pews. You may notice that we may turn the statue of St. John Vianney facing the congregation. We also will try to highlight the statue of St. John Vianney during the Year for Priests. American Legion Awards: Hilary Tuttle and Logan Perry, 4 Yr. Religion Awards: Taylor King and Wesley Guidroz. OC continues to receive gifts for the 2009 Angel Appeal Drive. Those gifts received by 19 June will be acknowledged in the summer SAGA newsletter under the designated giving level. Mail your gift, small or large, to the OC Development Office at 428 East Prudhomme St. in Opelousas. OC announces that a Barnes & Noble Book Fair supporting Opelousas Catholic will be held on June 13-14 from 10:00 a.m. to 9:00 p.m. at their location on Johnston St. in Lafayette. A percentage of sales at this time will be donated to the school. The First Holy Eucharist pictures and the Pictorial Directory of the Parishioners of St. Landry are still in the office patiently waiting to be picked up. Please see about this soon. Registration is on-going for Religious Education (grades 1-8). Classes will begin 13 July at 8:00am. 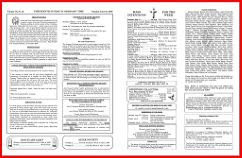 A copy of your child’s Baptism certificate is required. The blood of Christ will cleanse our consciences. Today’s Gospel tells the story of the preparation of the place where Jesus and his disciples were to eat the Last Supper. During that meal, the new covenant in Christ’s blood was established as an everlasting covenant that we celebrate to this day. As today’s Gospel is proclaimed, let us remember that it is at the table of the Eucharist that we can truly be transformed. Here at this table we taste newness of life. Why do you like receiving Holy Communion? What does it mean for you that the bread and wine becomes Jesus’ Body and Blood during the liturgy of the Eucharist? When you receive Holy Communion and hear the words “Body of Christ; Blood of Christ”, what are some of the thoughts and feelings that you have? 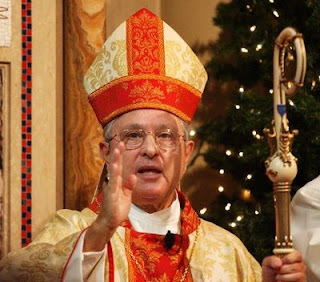 The Holy Father is accepting the retirement of Archbishop Alfred Hughes and has named the current Bishop of Austin, Gregory Aymond, as the new archbishop of the Diocese of New Orleans. His installation mass is scheduled at St. Louis Cathedral in New Orleans on August 20, 2009 at 2 PM. 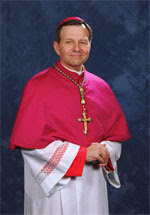 Bishop Aymond is 59 years old and could well serve many years for the diocese. He was raised in New Orleans (Gentilly) ... the first New Orleans native to be named Archbishop of the New Orleans Diocese ... and graduated from Cor Jesu High School (now Brother Martin). He enrolled in seminary at St. Joseph's in Covington and received his Master of Divinity from Notre Dame Seminary in New Orleans. He became rector and president of Notre Dame Seminary at that time. 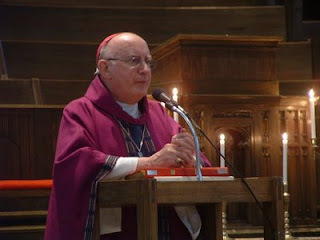 He became an auxiliary bishop in New Orleans in 1997 and Bishop of Austin Texas in 2001. New Orleans becomes what seems to be the first archdiocese to have 4 living archbishops ... including the retired archbishops. The legendary Archbishop Philip Hannan (1965-89) 96 years old, Archbishop Francis Schulte (1989-2001) 82 years old, and Archbishop Alfred Hughes (2002-2009) 76 years old, and now Aymond will make 4. New Orleans is still struggling with parish and school closings, much of which is a direct result of Hurricane Katrina. Having a young, strong, energetic archbishop at this time will certainly be welcomed. For the bishops are heralds of the faith, who draw new disciples to Christ; they are authentic teachers, that is, teachers endowed with the authority of Christ, who preach the faith to the people assigned to them, the faith which is destined to inform their thinking and direct their conduct; and under the light of the Holy Spirit they make that faith shine forth, drawing from the storehouse of revelation new things and old (cf. Mt. 13:52); they make it bear fruit and with watchfulness they ward off whatever errors threaten their flock (cf. 2 Tim. 4-14). At mass Sunday, we will celebrate the Feast of Corpus Christi, the Feast of the Body and Blood of Christ. The feast day has been moved to Sunday but today is the actual day of the feast which falls on the Thursday after Trinity Sunday. The hymn Pange Lingua was written by St. Thomas Aquinas. It was originally written for Corpus Christi processions. We sing it also on Holy Thursday during a procession when the Blessed Sacrament is reserved for Good Friday. Below is that hymn with a video. The lyrics don't begin until about 30 seconds into the video. Following that are the lyrics in the original Latin and in an English translation. The last two stanzas are commonly called Tantum Ergo and are sung during Benediction of the Blessed Sacrament. 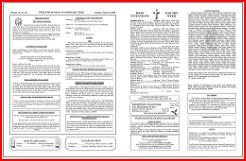 The bulletin for the weekend of June 14, 2009 has been posted. Click here to see it. 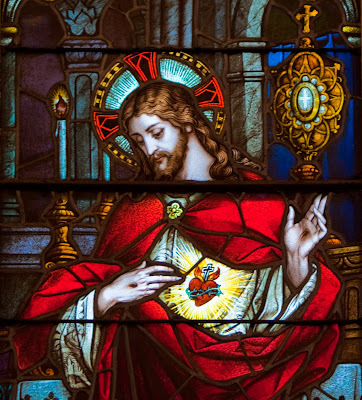 Friday, June 19th, is the Solemnity of the Sacred Heart of Jesus. The entire month of June is dedicated to the Sacred Heart. The photo above is a detail from art glass in St. Landry Catholic Church in Opelousas portraying the visions of St. Margaret Mary Alacoque (1647-1690) that helped to popularize this devotion. Click the photo to see it in more detail. Today is the day we start the Novena to the Sacred Heart. This novena was a favorite of St. Padre Pio. Our Father...Hail Mary....Glory Be To the Father....Sacred Heart of Jesus, I place all my trust in you. Our Father....Hail Mary....Glory Be to the Father...Sacred Heart of Jesus, I place all my trust in you. The photo above is a detail from The Crowning of Mary as Queen of Heaven, an art glass window in the northeast front of St. Landry Catholic Church. There, you can see Jesus, God the Father, and The Holy Spirit in the form of a dove between them at the crowning. Clicking on the photo will show even more detail. Remember that the beauty found within our church is more than cosmetic. Each of the beautiful works of art there portrays the truths of our faith. Congratulations to these senior athletes; Hilary Tuttle, Female Scholar Athlete; Meghan Curley, Female Scholar Athlete and Lady Viking of the Year; and Aaron Fontenot, Male Scholar Athlete and Viking of the Year. The Holy Spirit gives understanding. Overcoming the “breach” begun in Babel — the confusion of hearts, putting us one against the other — the Spirit opens borders. The People of God who found its first configuration on Mt. Sinai, now becomes enlarged to the point of recognizing no limitations. St. Paul explains and underlines this when he says: “It was in one Spirit that all of us, whether Jew or Greek, slave or free, were baptized into one body. All of us have been given to drink of the one Spirit” (1 Cor 12:13). On the technical side, the file sizes are about 4.5 megs which means it may a minute or two to download on slower internet connections. It is also an MP3 formatted file which means that these are essentially podcasts. Don't worry if all the technical words don't mean much to you. It means we're using the latest in technology in order to make sure our church parish can reach the most people. The current week's homily is available on a link on the front page of the website next to the link for the current week's bulletin. On the page with the prior bulletins, the corresponding homily will be sitting side by side with its bulletin. We started on the anniversary of the start of the Catholic Church, Pentecost Sunday. This week, The Most Holy Trinity, is our second homily to be posted. So, take a listen and let us know what you think. Click here to download The Most Holy Trinity Sunday homily. Bishop Jarrell will ordain three men to the Catholic Priesthood today Saturday, June 6, 2009. They are: Father Brad David Guillory, a Ville Platte native, appointed Associate Pastor of St. Mary Magdalen Parish in Abbeville. Father Clinton Sensat, from Scott, is appointed Associate Pastor of Sacred Heart of Jesus Parish in Ville Platte and of St. Joseph Parish in Ville Platte. Father Jude Willery Thierry, from Lawtell, is appointed Associate Pastor of St. Ann in Mamou. These appointments are effective June 24, 2009. May God bless the ministries of these newly ordained and bless the ministries of all priests. Please keep these newly ordained in your prayers as well as all priests and deacons. 24 hours of Eucharistic Adoration for the First Friday of the month is happening now in Valentin Chapel until mass at 8 AM Saturday morning. Please take the time to spend a holy hour there. The University of St. Thomas in Minnesota is honoring our former bishop, Harry Flynn, for his outstanding service as Archbishop of the Archdiocese of St. Paul-Minneapolis and as Chair of its Board of Trustees. Consistent with its tradition of naming a university building after an Archbishop Emeritus, St. Thomas will be naming one of its residence halls, Archbishop Harry Flynn Hall. If you would like to participate in this well-deserved recognition of our former bishop, you may make contributions to: University of St. Thomas, 1000 LaSalle Avenue, Minneapolis, MN 55403, attention of Dean Thomas Mengler. All benefactors from the Lafayette Diocese will be recognized on a plaque to be placed in Flynn Hall. Your contributions will support the establishment of the Archbishop Harry Flynn Law Scholarship Endowment. This scholarship endowment will support a worthy law student who contributes to the faith mission of Saint Thomas’ new Catholic law school. The Spirit bears witness that we are children of God. Jesus gives the eleven the command to go and make disciples of all the nations. Listen carefully to the words of Moses in today’s first reading. Moses reminds the people of all that God had done for them, for the Israelites had fallen into patterns of forgetfulness. On this Trinity Sunday, perhaps we need this kind of reminder as well. Just as the Israelites worshiped false gods, we, too, can fall into this same trap. Today’s feast stands as a reminder to us that there is one God who is Creator, Redeemer, and Holy Spirit. As we listen to the words of Moses, Saint Paul, and Saint Matthew, let us call to mind the action of God in our own lives and give praise and honor to the One who made us, redeemed us and remains with us always. Why do you think Catholics make “The Sign of the Cross” when we pray? How often do you think about God as Trinity? How do you relate to each member of the Trinity? As each of us is called and sent by Christ, how have you incorporated this into your own life, whether married, single, in religious life or ordained? 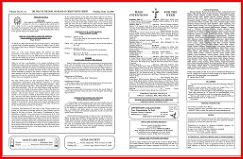 The bulletin for the weekend of June 07, 2009 has been posted. Click here to see it. Honor graduates leading their class of 2009 include covaledictorians Meghan Curley and Hilary Tuttle; salutatorian Victoria Lamonte; and historian Jade Latiolais. Catholic Youth Leadership Awards presented by our local Knights of Columbus Councils were awarded to Victoria Lamonte, Wesley Guidroz, Meghan Curley and David Guidry. Aaron Fontenot received the Jeanmard Fourth Degree K. C. medallion. Tonight is the Ecumenical Prayer Service for Hurricane Season at Hope Presbyterian Church. 434 S. Main St. • Opelousas, La. Find Bishop Schexnayder's Hurricane Prayer by clicking here. On Sunday, June 7, 2009, Fr. Gary Schexnayder will be a Priest forty years. He was ordained on June 7, 1969 in Arnaudville at his home parish, St. Francis Regis Church and served as Pastor at St. Landry from 1979 – 1989. Fr. Gary will observe the 40th Anniversary of his Ordination as a Catholic Priest on Sunday, June 7, at 1:00 pm in St. Michael the Archangel Church in Crowley, with the celebration of the Eucharist on the Feast of the Most Holy Trinity. Following the Mass, there will be a reception. You are gladly invited to the Mass and Reception. If you are unable to attend, your prayers and remembrances will be greatly appreciated. In Paul’s reflection on the Spirit, he not only explained his influence on the actions of Christians, but also on their being. Indeed, it is he who said that the Spirit of God dwells in us (cf. Rom 8:9, 1 Cor 3:16) and that “God has sent the Spirit of his Son into our hearts” (Gal 4:6). First things first: we need help. Our altar servers are doing a wonderful job but they are stretched thin. We need more servers. If you are a boy or girl who has completed the 4th grade or are older, OUR PARISH NEEDS YOU! Contact Dwayne Joubert about joining at 337-594-8408. There will be a workshop to help new altar servers learn all about the mass and just what the responsibilities are for being a server. Parents and grandparents, please encourage your children and grandchildren in this very important calling. On Saturday, June 13th from 8:30 am – 2:00 pm, the Diocese of Lafayette is hosting an outing for all Altar Servers at Teurlings Catholic School in Lafayette. Any Servers interested in attending, call Dwayne Joubert at 337-594-8408. Pope Benedict’s general prayer intention for June is: "That international attention towards the poorer countries may give rise to more concrete help, in particular to relieve them of the crushing burden of foreign debt"
His mission intention is: "That the particular Churches operating in regions marked by violence may be sustained by the love and concrete closeness of all the Catholics in the world". The current week's homily is available on a link on the front page of the website next to the link for the current week's bulletin. On the page with the prior bulletins, the corresponding homily will be sitting side by side with its bulletin. We're starting on the anniversary of the start of the Catholic Church, Pentecost Sunday. So, take a listen and let us know what you think. Click here to download our first one.